CARSON, Calif. (AP) — Philip Rivers and the Los Angeles Chargers looked almost ready for the regular season from their first series. Russell Wilson and the Seattle Seahawks probably feel like they’ve got more work to do. 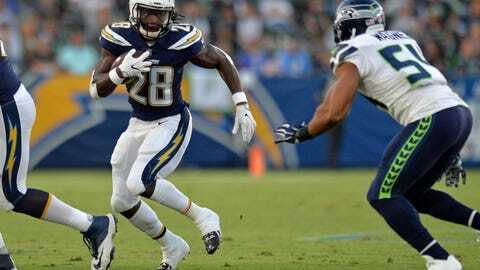 Melvin Gordon rushed for a short touchdown to cap a strong 70-yard opening drive by the Chargers’ first-team offense, and Rivers went 6 of 7 for 62 yards in Los Angeles’ 24-14 preseason victory over the Seahawks on Saturday night. JJ Jones returned a punt 72 yards for a touchdown late in the first half, and Mike Williams caught a 25-yard touchdown pass from Geno Smith in the second half of a solid performance by the Chargers (1-1) in the preseason home opener of their second season at compact StubHub Center. While Rivers played only two series, Wilson was 13 of 21 for 193 yards while playing the entire first half for the Seahawks (0-2). His offense was limited to two field goals by execution mistakes in the red zone, and Wilson was repeatedly flushed from the pocket by Melvin Ingram while the Chargers’ destructive pass rusher had an outstanding first half. David Moore made the Seahawks’ biggest play of the first half, hauling in a 52-yard catch between two Chargers downfield. Seattle could have kept it closer, but Chris Carson had a touchdown run waved off by a penalty and later fumbled at the goal line in the first half. Rivers’ work was shorter but still valuable, including a few plays on which the veteran capably eluded the Seattle rush and made strong throws on the run. Smith then made a strong argument for the backup job, going 6 of 8 for 85 yards. His TD pass came on an eye-opening catch by Williams, who jumped over Seattle cornerback Akeem King and hauled in the first score of his NFL career for a 21-6 lead. Williams was the seventh overall pick in last year’s draft, but the Clemson product’s career got off to a slow start because of injuries. He is healthy and eager to become a force in the Chargers’ already bulging receiving corps alongside Pro Bowler Keenan Allen, Travis Benjamin and Tyrell Williams. Seahawks rookie Alex McGough led a solid drive in the final minutes, hitting Malik Turner with a 12-yard touchdown pass. Robert Aguayo hit a 39-yard field goal with 40 seconds left, boosting his bid to win the Chargers’ kicking job. Jones made another argument for a spot on the regular-season roster with a spectacular burst through the heart of the Seahawks’ punt coverage team on the way to a score. The undrafted free agent from West Georgia has turned heads throughout camp. Chargers: S Jaylen Watkins started, but was helped off the field late in the first half with a right knee injury. Ingram fell on his teammate on the play, and Watkins couldn’t put weight on his leg. Chargers left tackle Russell Okung raised his right fist during the national anthem. Three Seahawks stayed off the field during the anthem for the second consecutive week: offensive tackle Duane Brown, defensive end Branden Jackson and defensive tackle Quinton Jefferson. Seahawks: At the Minnesota Vikings on Aug. 24. Chargers: Host the New Orleans Saints on Aug. 25.